After an intro that features a few lines borrowed from Jack Black's School Of Rock, the album kicks off with a great riff driven track entitled Kings Of Hollywood. Ez Gomer of Jet Circus provides a solid vocal performance that covers lots of ground including 80's hard rock in the L.A. Guns vein with some very modern Black Label Society styled guitar riffs. Sebastian Bach provides the vocals for Another Nail, a track that although features his trademark vocals, veers away from his normal musical style with it's softer melodic hard rack feel. The entire album is a very diverse collection of 80's influenced melodic hard rock that leans heavily towards the more commercial aspects of the 80's sound with State Of Grace featuring Russell Arcara (Surgin/Prophet/Arcara) even venturing into classic Bon Jovi territory. Things take on more of a heavy metal slant with Grenade, complete with heavy Velvet Revolver like riffs and the vocals of both Dale and Troy Thompson (Bride). One of the real surprises is the Leif Garrett track Sight Unseen. The washed-up ex 70's teen idol actually does a pretty decent job with this modern hard rock flavored song. Flinch, one of the better tracks, features Tony Harnell (ex-TNT, Starbreaker) and uses detuned guitars for a more modern heavier feel. Lots of melody in Tony's voice along with some more modern vocal effects makes for a great track. Mark Slaughter is featured on Thy Will Be Done, a mix of soft and heavier segments with the heavier sections reserved for the chorus sections. Other notables include the Journey flavored melodic hard rock track Always Tomorrow with Ted Poley (Danger Danger) on vocals and the soaring acoustic guitar ballad Make Believe that features the vocals of Mike Lee (Barren Cross). A few take on a more laid back acoustic approach with the majority of the songs firmly locked into the 80's Dokken, Slaughter, Mr. Big styles. I have to mention Joe Cerisano's (Trans-Siberian Orchestra) performance on the powerful piano ballad If The World Could Be Mine. The vibrato in his voice and emotional style really summons the ghosts of David Byron (classic Uriah Heep). Although there are Christian overtones to many of the tracks, it's not overly preachy but does draw comparisons to many of Justin Murr's life experiences with classic biblical events and other Christian symbolisms and ideals. However, I could really do without his attempt to convert everyone with his spoken rant at the outro to this CD but otherwise, this is a surprisingly solid collection of melodic hard rock that has lots of variety and styles and great song writing. All of the guest vocalists get writing credits for the songs that they perform and as a whole, this album gets better and better with each spin and is a great CD to put on if you need a great fix of 80's style melodic hard rock but have worn out all the classics from that era. Overall, it really does have a "soundtrack" feel to it. 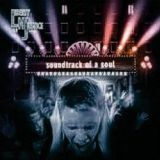 In this case, it's not a movie soundtrack but the Soundtrack Of A Soul....Justin Murr's soul in this case.